The evening kicked off with a panel discussion featuring Future Caucus co-chair Rep. Amanda Stuck (D-57) and caucus member Rep. Tyler Vorpagel (D-27). Other panelists included Molly Doerrer, MAP UW-Madison Treasurer, Nicholas Hillman, UW Madison Associate Professor of Educational Leadership & Policy Analysis, and Greg Offerman, Associate Director for Advising & Outreach at the UW-Madison Office of Student Financial Aid. MAP President Steven Olikara opened the panel with remarks, “There are a lot of solutions out there, but the ones that are most likely to make a difference in the lives of students and in college graduates are going to be the ones that are developed in a bipartisan way,” Olikara said. Rep. Stuck and the other panelists echoed this sentiment, “The biggest thing about this issue is that we all can agree it’s an issue … that it’s something worth looking at,” Stuck said. 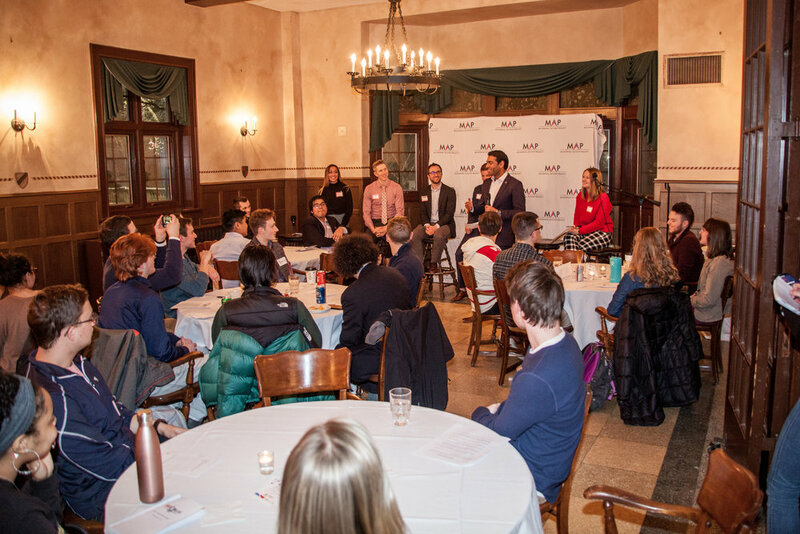 The students had their opportunity to weigh in during small group discussions where they discussed their personal experiences with financing higher education, and ideas for policy reform.